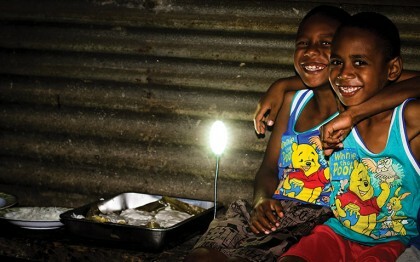 Sales of solar lights across the north of the Pacific island nation are just the first step in a project that has multiple benefits for communities. David Cook reports from his visit there in February 2016. Marsden Vuvu looks up from behind his desk and welcomes us with a huge smile, before wheeling himself out to warmly shake our hands. Marsden has recently been appointed as a sales agent for our solar lights project in this part of northern Vanuatu. We have travelled here to the island of Ambae to bring him some new portable Firefly solar lights made by Australian-based company Barefoot Power. Marsden was born in a small village in a remote part of Ambae. He contracted polio when he was six, which hugely limited his mobility and health. At 14, some missionaries brought him to the hospital in the town of Lolowai. He has lived here ever since. After time at the hospital helping to improve his health, and where he received his first wheelchair, the missionaries sent him to the local Anglican boarding school, St Patrick’s College, where he achieved Year 8. Now 67, Marsden is the latest person to benefit from Anglican Overseas Aid’s partnership with the Anglican Church of Melanesia (ACOM) to sell solar lights at affordable prices around northern Vanuatu. He will sell them through the small bookshop that he manages. Selling solar lights as a more reliable source of light that helps people save money, reduce the use of dangerous and unhealthy kerosene as a light source, and provide income-generating opportunities. Education around financial literacy and home budgeting to help people better manage the money they make from solar sales or related businesses, or that they save from the reduced costs associated with lighting. The establishment of savings groups, particularly for women, to help them work together to achieve bigger savings goals. Community self-reliance projects funded with seed money that pays for elements of larger, community-driven proposals. A short walk from Marsden’s office, we visit the home of Shenina Leodoro to find out about the impact of solar lights on family life. Shenina’s children eat their evening meal by the light of the family’s solar lamp. Shenina and her husband take work where they can to provide for their three children, substituting their small and unpredictable income by growing their own food and preparing food to sell. Shenina says the solar light she purchased helps the family save money as they no longer have to regularly buy torch batteries and kerosene. She is also able to cook food at night to sell, which increases their income. The light also allows the children to do their homework at night, and it makes family time at night easier. Further west on Santo island, a small grant from the project has enabled a community to build their own market house to sell produce locally. Jenny John, a mother of three, tells us that before the market house was built, the only option for selling produce was to pay to take it by truck more than an hour to the main town of Luganville, but it was always a gamble. If sales were poor, they could actually lose money. Now that they have the market house, they are saving time and money. “I find it much easier to sell my produce here than going into town because going into town is expensive,” says Jenny. “And sometimes you don’t make much money in town. But here we don’t spend anything and it’s easier to make money. The money helps me to support my family. I buy them food, pay for school fees.” The grant paid for basic materials such as cement for the building’s foundation, transportation costs for coral and sand, and nails, along with a large solar panel and lighting that means community members can continue selling goods at night. Community members also provided the remaining local materials, and built the market house themselves. ACOM has also recently started a savings and education group in the community, and people are keen to learn how to save with the money they are making through the market house. Jenny has joined the group, and has big plans. “My goal is to buy a piece of land where me and my family can move into,” she says. 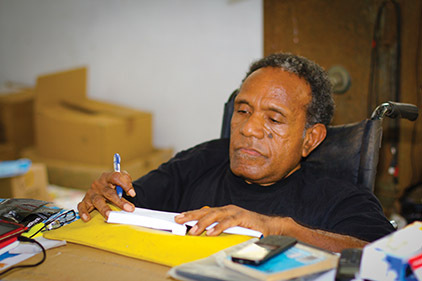 Back in Ambae, Marsden is preparing to return to his paperwork. “My hope is for the people in the villages to know more about the solar because it helps them at night lighting their house and also charging their phones,” he says. “I just want them to know more about it on Ambae. But for me, my part is to make awareness and promote the solar.” With his glowing personality and the respect that he commands around the island, it shouldn’t be a problem. Profits from the sales of solar lights are usually split between the selling agent and local community-based projects. In Marsden’s case, his ‘share’ of the profits goes back to the bookshop, helping to maintain the business and his job. “We would like to say thank you very much for helping us. We really appreciate your help. From us, all of us here, we would like to say thank you so much,” he says. The Women and Youth Empowerment Project is funded by grants from the Australian Government’s aid budget and donations from the Australian public.